Bellagio is a luxury, AAA Five Diamond award-winning hotel and casino and a member of The Leading Hotels of the World. It is owned by MGM Resorts International and was built on the site of the demolished Dunes hotel and casino. The resort serves as the seat of the corporate headquarters for MGM Resorts International and is considered the main flagship resort of the gaming company. Inspired by the Lake Como resort of Bellagio in Italy, Bellagio is famed for its elegance. 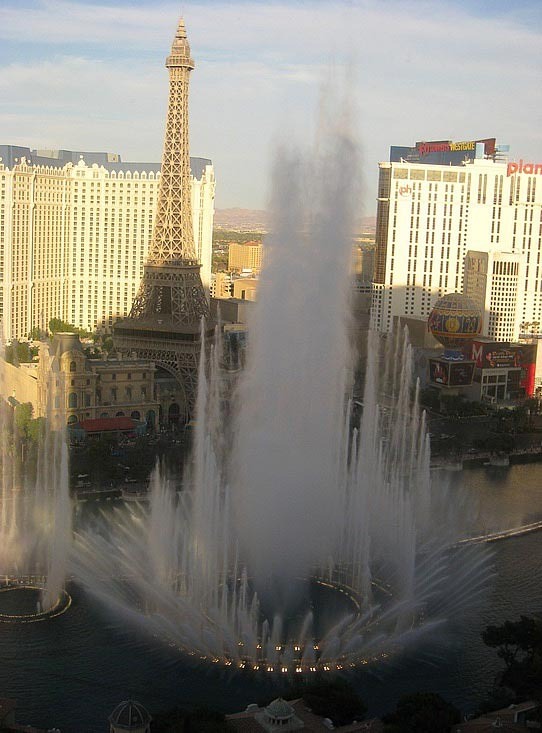 One of its most notable features is an 8-acre (3.2 ha) lake between the building and the Strip, which houses the Fountains of Bellagio, a large dancing water fountain synchronized to music. Inside Bellagio, Dale Chihuly’s Fiori di Como, composed of over 2,000 hand-blown glass flowers, covers 2,000 sq ft (190 m2) of the lobby ceiling. Bellagio is home to Cirque du Soleil’s aquatic production “O”. Casino: Yes, 116,000 square feet. Casino games include Blackjack, Caribbean Stud Poker, Craps, Keno, Let It Ride, Poker, Pai Gow Poker, Roulette, Slots, Big Six, Baccarat and Megabucks. The casino has a poker room. Race & Sports Book: Yes, a 200-seat race and sports book, equipped with 137 televisions and four big screens, 15 on betting window and 20 at bar area 32″ screens. Restaurants: Bellagio has the following dining options: Café Bellagio, Café Gelato, Circo, FIX, Jasmine, Jean-Philippe Pâtisserie, Le Cirque, Michael Mina, Noodles, Todd English’s Olives, Palio, Palio Pronto, Petrossian Bar, Picasso, Pool Café, Prime, Snacks, The Buffet, Sensi (located in the Spa Tower), and Yellowtail Sushi Restaurant & Bar. Entertainment: Entertainment can be found in the 1,800-seat showroom, which features the show “O” from Cirque du Soleil, and in the lounges. Nightlife: The Bank, Caramel and Fontana. Attractions: The Fountains at Bellagio, a water and light show choreographed to music, The Conservatory, Bellagio Gallery of Fine Art, The Arcade and The Tuscany Kitchen. The Richard McDonald gallery is located at the “O” Theater and Conservatory. There is also the Jeff Mitchum Gallery located at the hotel’s pool promenade. Pool: Yes, five pools and four Jacuzzis in a Mediterranean-style setting. Spa: Yes, the 65,000-square-footSpa Bellagiooffers multiple types of massages and services in its 56 treatment rooms. The spa also offers a 6,000-square-foot fitness facility, 1,000-square-foot exercise room and salon. Shops: Yes, specialty shops are located in Via Bellagio, an avenue of upscale shops within the hotel. There is also Bellagio at Home, Chic Affairs, Via Bellagio, Via Fiore, Cirque du Soleil store, Bellagio Lobby, Jean Philippe and Pool Promenade. Wedding Services: Yes, the Wedding Chapel at Bellagio offers a number wedding ceremony packages. Convention Rooms: Yes, 45,000-square-foot Grand Ballroom, 22,000-square-foot Bellagio Ballroom and 14 meeting rooms ranging in size from 1,000 to 10,000 square feet. In-Room Internet Access: All rooms have high-speed Internet access. Parking Garage: Yes, a four-story parking garage. Standard Room Amenities: Air conditioning, alarm clock, flat-screen remote-controlled cable television, desk, hair dryer, electronic door locks, laptop-sized in-room safe, iron and ironing board, pay-per-view movies, mini bar, radio, telephone, voice mail. Incidental Charges: The hotel charges a resort fee of $20 per night, per room upon check-in, which covers the cost of in suite high-speed and wireless internet access, local and 800 phone calls, fitness center access, complimentary printing of boarding passes at the business center. Guests are responsible for all incidental charges. The resort fee listed above does not include tax. Some resorts also apply room tax to their resort fee. There is a Hotel requires a credit card or a cash deposit for incidental charges.